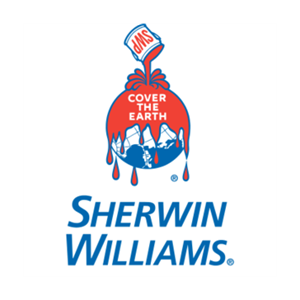 Sherwin Williams is your property management partner from big projects to small, from the interior to the exterior, from the walls to the walkways, we have what you need to make your property stand out. Need applicators, tools and equipment to get the job done right, no problem with our 3,300 stores, 1,400 sales representatives and 120 floorcovering centers. Each field representative is ready to provide fast, local service and onsite assistance. with competitive uniform pricing and even online ordering availability. Sherwin Williams is your single-source supplier for all the solutions that make your job easier. We have a wide range of high-performance coating systems for walls, floors, roofs and concrete surfaces. We can also help with heavy-duty floor coatings, decorative flooring systems, blinds and wallcoverings. In need carpet, vinyl, tile or other types of flooring, we have a wide selection of flooring available with fast, professional installation. Doing a project, our color design services can help create beautifully coordinated schemes to satisfy your residents or add a splash of color to units for a bold point of differentiation. Also exterior photo imaging provides a range of color options to enhance curb appeal and takes the guesswork out of color selection. Ask Sherwin Williams. Areas of Expertise Flooring & Paint My company is a member of Compliance Depot.